We return to our re-read project to wrap up Volume 19, diving deep into the spark that ignites Albion's destruction — the spectral ooze. You sure...? I just downloaded it from the links above, and it works as it should. Could be that the RSS feed hasn't updated itself from the latest episode, and you grabbed Episode 80. I deleted it and re downloaded it and its all set. Thanks! Always love the podcast! Awesome podcast as always Thanks! omg fury trains. I cant even. Great episode guys. This arc is the one with the most confusion often with people, so it's great to hear a breakdown. Thanks. Yeah, it's one of the parts of the series that isn't explicitly explained, and I think can be confusing if you don't really reason it out. On the one hand, you could simply say that Casca's proximity to the evil stuff activated them, and set off a chain reaction that ended with the tower collapsing. 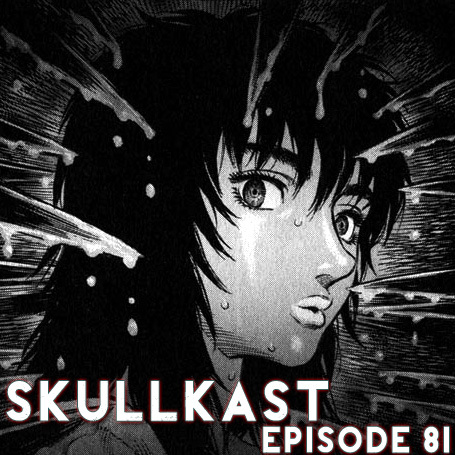 But ... well, we're a Berserk podcast, so we have to go a little deeper than that, hehe. I learned a lot just from doing this re-read and talking about it with the group, particularly about the nature of these specific specters. It's a unique part of the series and the nature of the spectral blobs is really only implied. I feel like they act as stand ins for Apostles in this shadow of an Eclipse that Skull Knight alludes to. I imagine it's also unique to St. Albion's mass graves since we never see the proximity of our two branded characters triggering anything like it again. It's a unique part of the series and the nature of the spectral blobs is really only implied. I feel like they act as stand ins for Apostles in this shadow of an Eclipse that Skull Knight alludes to. The spectral blobs' devouring of the refugees indeed corresponds to the apostles and their devouring of the Falcons — that's a key part of the allegory SK was talking about (as was Guts/Casca/Femto/SK/Zodd's presence). I imagine it's also unique to St. Albion's mass graves since we never see the proximity of our two branded characters triggering anything like it again. Like Aaz mentioned on the show, we've seen another unique spectral entity before — the tree outside Jill's village. Humans were sacrificed, trapped there. Over the years, their souls intermingled and associated with the tree, and when Guts awoke it, they manifested from the tree. The same happened in and around Albion. Tortured souls commingled and fermented there for dozens, perhaps hundreds of years. And when they were awoken, they were no longer the disparate, floating specters that haunt Guts — they were souls manifested out of the blood and decay beneath Albion. I think you could also argue that we saw something similar to this spectral amalgamation in Volume 10, when Griffith was granted a vision of the God Hand. I also agree that the last anime was very easy to forget, as i can barely picture scenes in my mind. Well done brain! Thanks for another fine podcast, guys and gal!